First Novels Club: 2012 Children's Writer's and Illustrator's Market GIVEAWAY! 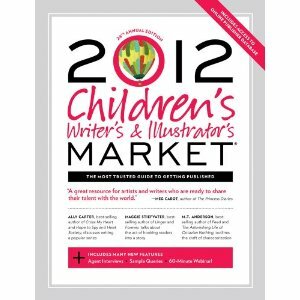 2012 Children's Writer's and Illustrator's Market GIVEAWAY! Many of us YA/MG writers say that we will do anything and everything to perfect our work and give ourselves the best chance possible to beat the odds and get our novel published. We kill our darlings, agonize for hours over plot twists, eavesdrop on other people's conversations (for dialogue research, of course! ), and revise and revise (and revise) until our eyes can barely focus on the computer screen and we've developed an acute case of carpal tunnel. We read every book in our genre (and plenty more beyond it), follow countless industry and advice blogs, keep up with the trends, social network until our brains become one big Twitter feed, and ask for conference registration fees for Christmas and birthday presents. If you're nodding your head, there's one book on industry and craft that you NEED to buy: The 2012 Children's Writer's and Illustrator's Market. And we're giving away two copies!!! This book is a fantastic resource for anyone who wants to get published in the kid lit world, and this year's edition is edited by Chuck Sambuchino, the mastermind of awesomesauce behind the Guide to Literary Agents blog and the editor of the 2012 Guide to Literary Agents. Additionally, there are other interviews with bestselling authors like Meg Cabot, Ally Carter, and MT Anderson, as well as sample queries and advice from top literary agents. Kidlit agent extraordinaire Mary Kole contributed two articles, one about making the most of writer's conferences as a newbie or a veteran attendee and one on crafting voice, character, and authority (taming those three most tricky beasts). Plus, you get over 700 updated listings for agents, publishers, and magazines that take work from children’s writers and illustrators. And did I mention the 60-minute free webinar with Chuck that will teach you how to use the book and see your work in print? And access to an online publisher database? Pretty much, it's the best $18.05 you can spend this year to help your writing career. And it will offer precious minutes during which you don't have to stare at a computer screen, and you can use fun things like Post-It flags and colored highlighters because dammit they are awesome! So enter below to win one of two copies we're giving away, but if you don't win, be sure to buy a copy of your own! Great review! You have a fabulous blog! I’m an author and illustrator and I made some awards to give to fellow bloggers whose sites I enjoy. I want to award you with the Best Books Blog Award. There are no pass along requirements. This is just to reward you for all the hard work you do! Thank you so much for taking the time to read and review all these books for us authors and readers.